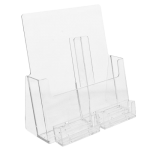 This multi-tier, countertop brochure holder gives your brochures maximum display in a small, compact foot print. The diversity allows you to attach this to a wall, slat wall, wire grid or peg board. 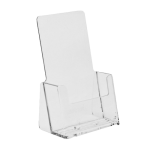 There are unlimited possibilities with this elegant, crystal clear brochure holder. The extra deep pockets are ideal so you spend less time refilling brochures. 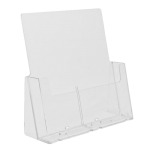 Ideal for tri-fold brochures up to 4 3/8'' wide and single card brochures. Display up to four different styles of brochures in one display. High traffic counters, tourism offices, financial institutions, wherever tri-fold brochures or single card brochures up to 4 3/8" wide is needed. This unit is wall mountable, slat wall or grid wire.